Located between the prairies and the Canadian Rocky Mountains, Calgary is a chic urban landscape known for its river parkways and natural spaces. Visitors can enjoy the great outdoors by day and world class entertainment and cuisine by night. A place buzzing with innovative energy while embracing its rich western heritage. 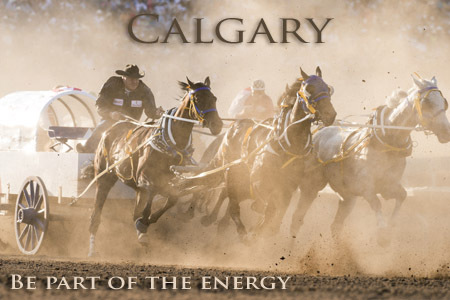 Known around the world for the Calgary Stampede, visitors come from all over to experience The Greatest Show on Earth. Take in a concert at one of the many beer tents and concert venues, explore the midway with rides, fair food and games and don’t miss the famed Chuckwagon races, bull riding, barrel racing and the Grand Stand Show. New in 2016, Enmax Park will open across the river from the grounds with 30 acres of inner city parkland which will be the new home of Calgary Stampede’s Indian Village. You won’t want to miss the opening of Studio Bell, home of the National Music Centre this summer! Explore five floors of exhibitions that tell the story of music in Canada, celebrate music icons at the Canadian Halls of Fame and take a peek at the famed Rolling Stones Mobile Studio. Calgary Stampede fair grounds with views of the Bow River and downtown in Alberta. 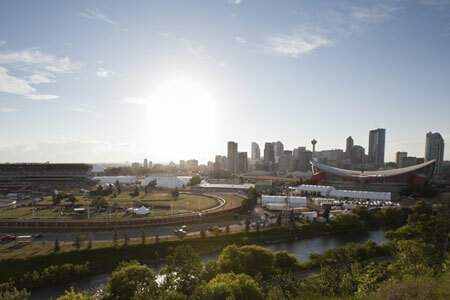 Visit Calgary’s newest neighbourhood, East Village, for a stroll along the river pathways to St. Patrick’s Island and pop into the redeveloped Simmons Building- an historical landmark and gathering place and home to three of the city’s most buzzworthy culinary tenants: Charbar, Phil & Sebastian Coffee Roasters and Sidewalk Citizen Bakery. 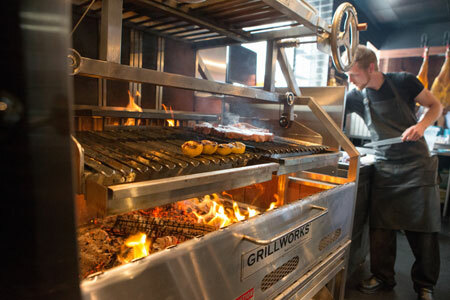 Kitchen grill at Charbar Restaurant. Recently designated the Cultural Capital of Canada, Calgary has a wide variety of arts and performing arts – theatre, music and dance. Celebrating The Year of Music, Calgary will host the 2016 Juno Awards along with several annual events including Calgary Folk Music Festival in Prince’s Island Park, Sled Island, Calgary International Blues Festival, and Opera in the Village. 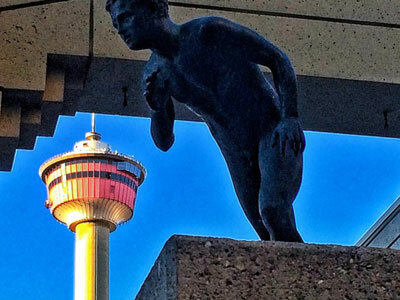 The city is peppered with public art including the 12-metre sculpture of a human head by Jaume Plensa titled, “Wonderland.” Check out a self-guided walking tour of the downtown core. 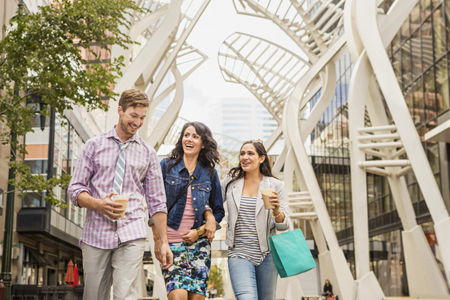 For those looking to explore local style and fashion take a stroll down Stephen Avenue and shop the CORE, a shopping centre that sprawls several city blocks connecting several high rise towers with the +15 ped-way system. Nearby, Kensington Village, Inglewood, 17th Ave are some of Calgary’s well known and historic areas boasting shops, independent boutiques art galleries, music venues, and restaurants. And we cannot forget the popular outlet mall, CrossIron Mills to the north of Calgary. Three people shopping and walking down Stephen Avenue in front of the tree sculptures. Whether you’re a history buff or a thrill seeker, Calgary’s city attractions are not to be missed. Travel back in time and learn about the history of western Canada at the Glenbow Museum or specifically about Calgary’s origins at Fort Calgary. 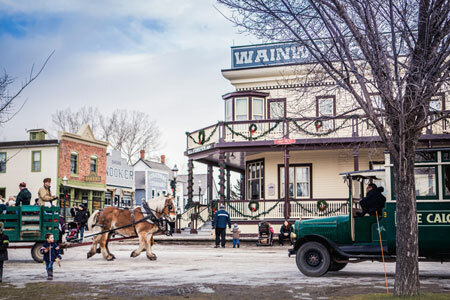 Or take a visit to Canada’s largest living history museum, Heritage Park Historical Village and with their Gasoline Alley full of antique vehicles, gal pumps and automotive memorabilia. Take in the panoramic views of Calgary and as far as the Rocky Mountains to the west and prairies to the east from the Calgary Tower and dare to step onto the glass floor observation deck, 160 m (525 ft) above the street below. Or get to know some of Canada’s most impressive animals at the Calgary Zoo including bears, bison, wolves and many more. If sport is your game, visit the 1988 Olympic Game legacy, Canada Olympic Park where you can shoot down the bobsleigh track, a zip line and ride on the Skyline Luge – the longest luge course in the world. Be sure to take in a professional ice hockey or football game with the local teams- Flames and the Stampeders. Of course with all of this western hospitality, we’re also big into horses so check out the show jumping at Spruce Meadows. 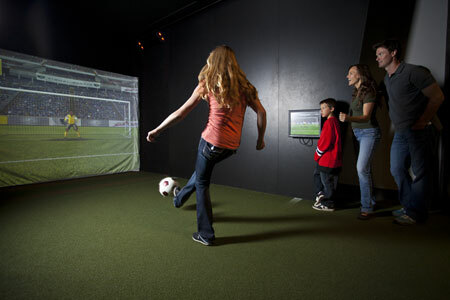 One of five sports on the multi-sport simulator at Canada`s Olympic Park. Calgary is also the perfect home base for those wanting to visit the Canadian Rocky Mountains with Banff National Park a mere hour away by car or the mysterious Canadian Badlands, a moonscape of unusual rock formations and dinosaur bonebeds just one hour east. 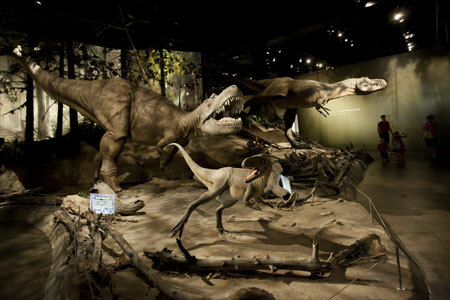 Dinosaur exhibit in the Royal Tyrell Museum in Drumheller. Complete your trip to Calgary by booking your accommodation at a unique Bed & Breakfast at BBCanada.com.